I have viewed this piece at The Baltic a few times now. I did not run to write a blog about it, as I wasn’t entirely sure what I thought. I needed more time to process what I’d seen and I also felt like I had to see it again before I could formulate my thoughts into anything worthwhile. That is not a negative thing. The fact that this work forced me to really think and contemplate my experience of it shows its staying power and effectiveness. The work is co-authored by Alice Theobald and Atomik Architecture. It’s an endevour to blend an artistic practice with architecture. Given that Theobald works in performance, sound and installation, it’s quite an ambitious choice of blend. Hence my excessive contemplation over it all. It was interesting because when I arrived on Level 2 the above scene is what I was greeted by. There’s an instant blockade which suggests a lack of access. A lot of visitors did in fact question whether or not they were allowed to enter the structure. I don’t know if it’s because I’m an art student and have seen things like this before, or if it was just an assumption on my behalf, but I entered without hesitating. I knew it was designed to make the viewer question so I was instantly quite taken by it! That was before I even entered the structure which is made up of everyday objects such as duvets. The comfort of that item in a space as awkward and industrial as this was quite a contrast. It brought the idea of comfort zone and bedroom space into a gallery setting which was an unusual experience. Yet it demonstrates the success of the piece given its play on the conventional associations of architecture. 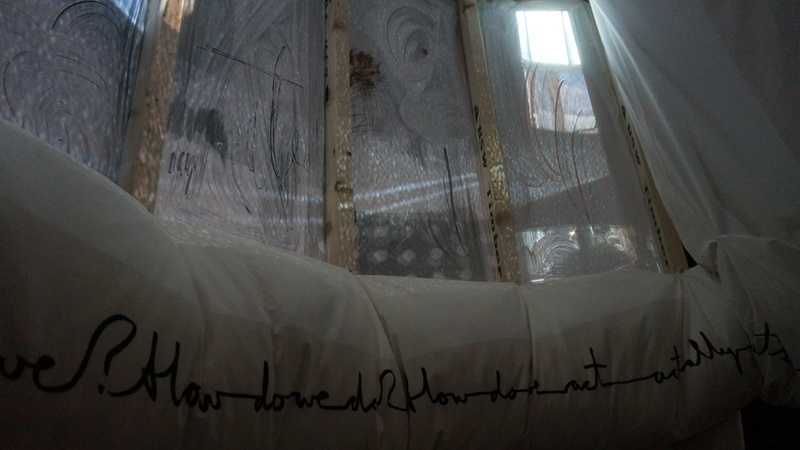 There was writing scrawled across these interior duvet forms; it was difficult to make out so it took a lot of time to read. I found myself reading out loud in an attempt to process it better. This play on interior and exterior was brilliantly constructed. As the piece had all sorts of components including sound, video, performance through the installation, it could have been a very overwhelming experience. However, given how they had broken up the space by placing spherical structures at various intervals, it created an easing of the senses. There was singing playing throughout the gallery and the spoken word as well, yet when I entered the ‘duvet columns’ as I will call them, the exterior sound reduced slightly, allowing me to better concentrate on the text. These ‘duvet columns’ were dauntingly high, so much so that they reached the ceiling. As well as emphasisng the expansive nature of the piece, it also really highlighted the relationship between the work and the architecture of the gallery. It was entirely work-in-situ. This was highly effective as it is not often you contemplate the ceiling of a gallery space, yet Theobold and Atomik make it a key element. The height also furthers the emphasis on the difference between interior and exterior. As does the fact I was being videoed as I circulated the work. There was a live stream documenting people walk through the work. This meant at certain points there were projections of my face at certain points up on the outer walls of the structures! This was on the one hand quite funny and amusing, but on the other quite uncomfortable. It was a relief to get out of the view of the cameras once I was back inside the columns! This created two different emotions for me in response to the entire space. Outside and looking up at the columns made me feel small and exposed; being inside the columns surrounded by duvets and away from the cameras made me feel comfortable and safe. Two entirely different experiences, both within the same space. I’m so glad I went more than once before I wrote about it, as my experiences both times were entirely different. The first time I went there was music in the background and performers on the stage, the second time I went there were no performers with only a woman speaking as the audio. Two entirely different situations, but again within the same space. This led me to question how the piece is set up, do the performers come on at a fixed time everyday? Do they perform daily? Do they improvise? Why is there music when they are on stage in stead of the spoken word, is it to make it more theatrical? All very interesting questions that contribute towards the complexity of the piece. It’s not what people would call ‘pretty art’. Personally however, I far prefer art that challenges me and really forces me to question it. Theobald and Atomik are certainly successful in that respect.